Renal disease and renal failure are common in the elderly. Acceptance of patients aged 65 years and over for renal replacement therapy approximately doubles the number of such patients in whom renal replacement is initiated. Renal failure in the elderly more often results from renal vascular disease or urinary tract obstruction than in younger age groups. In males, obstruction is most often due to benign or malignant prostatic enlargement, while in females it results from pelvic cancer. Progressive sclerosis of glomeruli occurs with ageing and this, together with the development of atheromatous renal vascular disease, accounts for the progressive reduction in GFR seen with advancing years. A GFR of 50-60 rnl min ” (about half the normal value for a young adult) may be regarded as ‘normal’ in patients in their eighties. The reduction in muscle mass often seen with ageing may mask this deterioration in renal function in that the serum creatinine concentration may be less than 0.12 mmol litre ” in an elderly patient whose GFR is 50 rnl min’ or lower. The use of serum creatinine as a measure of renal function in the elderly must take this into account. This is especially important in the elderly when prescribing drugs whose excretion is in whole or in part by the kidney. URINARY TRACT INFECTIONS are more common in the elderly, in whom impaired bladder emptying due to prostatic disease in males and neuropathic bladderespecially common in females-is frequently found. Symptoms may be atypical, the major complaints being incontinence, nocturia, smelly urine or vague change in well-being with little in the way of dysuria. Demonstration of significant bacteriuria in the presence of such symptoms requires treatment. URINARY INCONTINENCE is one of the major disabilities of the elderly. Correctable factors, such as chronic constipation, infections and treatable bladder outflow impairment need to be excluded. An expert and committed incontinence advisory and treatment service combining nursing and medical skills is invaluable in elderly patients with this distressing problem. Home visits to ensure the availability of commodes and toilets is essential. 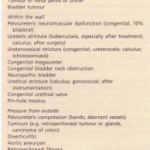 For established incontinence, catheterization may be necessary. Cameron JS, Davison AM, Grunfeld JP, Kerr DNS & Ritz E (eds) (1991) Oxford Textbook of Clinical Nephrology . Oxford: Oxford University Press. Coe FL, Parks JH & Asplin JR (1992) Medical progress: The pathogenesis and treatment of kidney stones. New England Journal of Medicine 327, 1141-1152. Feehally J (1988) Immune mechanisms in glomerular IgA deposition. Nephrology Dialysis Transplantation 3, 361-378. 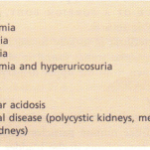 Jacobson HS (1991) Chronic renal failure: pathophysiology. Lancet 338, 419—423. 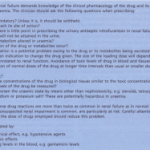 Klahr S (1991) Chronic renal failure: management. Lancet 338, 423—427. 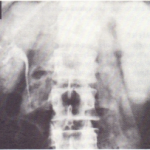 Lee DBN, Goodman WG & Coburn JW (1988) Renal osteodystrophy: some new questions on an old disorder. American Journal of Kidney Diseases XI, 365- 376. Lewis EJ, Hunsicker LG, Bain RP & Rohde RD (1993) The effect of angiotensin-converting enzyme inhibition on diabetic nephropathy. New England Journal of Medicine 329: 1456—1462. Nolph KD, Lindblad AS & ovak JW (1988) Current concepts: Continuous ambulatory peritoneal dialysis. New England Journal of Medicine 318, 1595-1600. Robinson AJ (1994) Antineutrophil cytoplasmic antibodies (ANCA) and the systemic vasculitides. Nephrology, Dialysis, Transplantation 9, 119-126. Weatherall DJ, Ledingham JGG & Warrell JDA (eds) (1994) Oxford Textbook of Medicine, 3rd edn, section on nephrology. Oxford: Oxford University Press. Current Opinions in Nephrology and Hypertension, ed Brenner BM. Current Science. Monthly journal with review articles: each issue devoted to one or two topics. Nephrology, Dialysis, Transplantation. Oxford University Press. This is the major European journal devoted to the subject, with review articles, editorial comments and original papers.